The global nature of antibiotic resistance calls for a global response, both in the geographic sense and across the whole range of sectors involved. In line with a One Health approach, healthcare plays a central role in preventing the emergence and spread of antibiotic resistance. We all have to participate in this challenge! Antibiotic resistance (ABR) has emerged as one of the principal public health problems of the 21st century. This has resulted in a public health crisis of international concern, which threatens the practice of modern medicine, animal health and food security. New mechanisms of resistance continue to emerge and spread globally, threatening our ability to treat common infections. Antibacterial use in animal and agricultural industries aggravates selective pressure on microbes. The burden of ABR is difficult to quantify in some regions of the world because enhanced surveillance requires personnel, equipment and financial resources that are not always available. However, the worldwide impact of ABR is significant in terms of economic and patient outcomes. Although most physicians are aware of the problem of antimicrobial resistance, most underestimate this problem in their own hospital and prescribe inappropriately antibiotics. The global nature of antibiotic resistance calls for a global response, both in the geographic sense and across the whole range of sectors involved. In line with a One Health approach, healthcare plays a central role in preventing the emergence and spread of antimicrobial resistance. In line with the WHO Global Action Plan, raising awareness of ABR by education and dissemination of information to stakeholders is an important factor in changing behaviors. An effective and cost-effective strategy to reduce ABR should involve a multi-faceted approach aimed at optimizing antibiotic use, strengthening surveillance and infection prevention and control, and improving education regarding the appropriate use of antibiotics. Making antimicrobial resistance a core component of professional education, training, certification, continuing education and development in the health practice may help to ensure proper understanding and awareness among professionals. From 2015, each November, the World Health Organization organizes an annual campaign raising awareness of the threat of antibiotic resistance and the importance of appropriate antibiotic use. World Antibiotic Awareness Week (WAAW) aims to increase global awareness of antibiotic resistance and to encourage best practices among the general public, health workers and policy makers to avoid the further emergence and spread of antibiotic resistance. All should be encouraged to join this campaign and help raise awareness of antibiotic resistance worldwide. 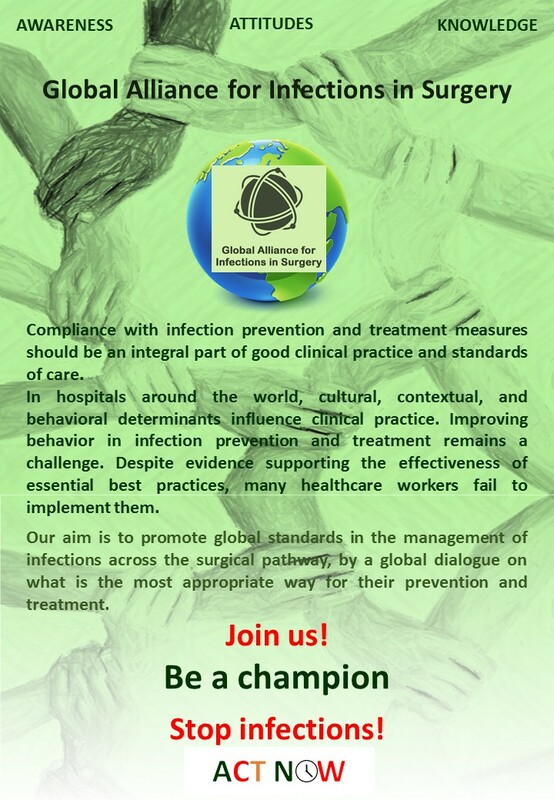 This activity should include the promotion of universal hand hygiene and all infection prevention and control interventions that have been proven to prevent healthcare-associated infections (HCAIs). HCAIs are infections that occur while receiving health care. Patients with medical devices (central lines, urinary catheters, ventilators) or who undergo surgical procedures are at risk of acquiring HCAIs. HCAIs remain a major clinical problem in terms of morbidity, mortality, length of hospital stay and overall direct and not-direct costs in all regions of the world. HCAIs show higher resistance rates to antibiotics than community-acquired infections. The prevention and management of HCAIs has advanced greatly over the last decade due to legislative, regulatory and organizational incentives. However, these changes have not resolved the gap between evidence base and clinical practice, particularly in healthcare workers’ behavioral change. Surgical site infections (SSIs) are the most common HCAIs among surgical patients. It is obviously important to improve patient safety by reducing the occurrence of surgical site infections. Both the World Health Organization (WHO) and the Centers for Disease Control and Prevention (CDC) have recently published guidelines for the prevention of surgical site infections. Despite clear evidence and guidelines to direct SSIs prevention strategies, compliance is uniformly poor and major difficulties arise when introducing evidence and clinical guidelines into routine daily practice. In a health-care facility, the sources of infection, and of the preceding contamination, may be the personnel, the patients, or the inanimate environment. cut off any route of transmission. The separation of the source has to be interpreted in a broad sense. It includes not only the isolation of infected patients but also all “aseptic techniques”—the measures that are intended to act as a barrier between infected or potentially contaminated tissue and the environment, including other patients and personnel. As the hands of health-care workers are the most frequent vehicle of nosocomial infections, hand hygiene is the primary preventive measure. Proper hand hygiene is the most important, simplest, and least expensive means of reducing the prevalence of HCAIs and the spread of ABR. Cleaning hands healthcare workers can prevent the spread of microorganisms, including those that are resistant to antibiotics and are becoming difficult, if not impossible, to treat. Despite acknowledgement of the critically important role of hand hygiene in reducing the transmission of pathogenic microorganisms, overall compliance with hand hygiene is less than optimal in many healthcare settings worldwide. In most healthcare institutions, adherence to recommended hand-washing practices remains unacceptably low. Hand hygiene reflects awareness, attitudes and behaviors towards infection prevention and control. Isolation or cohorting of colonized/infected patients is a cornerstone of infection prevention and control. Its purpose is to prevent the transmission of microorganisms from infected or colonized patients to other patients, hospital visitors, and healthcare workers, who may subsequently transmit them to other patients or become infected or colonized themselves. Isolating a patient with highly resistant bacteria is beneficial in stopping patient-to-patient spread. Isolation measures should be an integral part of any infection prevention and control program, however they are often not applied consistently and rigorously, because they are expensive, time-consuming and often uncomfortable for patients. Environmental cleaning is another fundamental principle of infection prevention in healthcare settings. Contaminated hospital surfaces play an important role in the transmission of micro-organisms, including Clostridium difficile, and multidrug-resistant organisms such as methicillin-resistant Staphylococcus aureus (MRSA) and vancomycin-resistant enterococci (VRE). Therefore, appropriate cleaning and disinfection of surfaces and equipment which patients and healthcare personnel touch are necessary to reduce exposure. It is widely acknowledged that surveillance systems allow the evaluation of the local burden of HCAIs and ABR and contribute to the early detection of HAIs including the identification of clusters and outbreaks.Surveillance of HCAIs is important because studies, have demonstrated that many infections can be prevented through having infection and control surveillance programs in place. Surveillance systems are vital for effective prevention and control of HCAIs and are a cost-effective approach to reducing disease. Surveillance also allows hospitals and clinicians to measure the effectiveness of strategies that are implemented to decrease infection rates. Infection rate data should be used in a positive way to improve the quality and safety of healthcare. The HCAI surveillance is conventionally conducted by two methods. Passive surveillance (self-reporting of suspected HAI by the treating physicians) is a very poor and inefficient method to track HCAIs as there is a risk of bias and underreporting. Active surveillance, on the other hand, is the systematic collection of data by a designated unbiased surveillance team. This is the method recommended by the main surveillance networks. Following the data extraction, analysis of the collected information should be done. Feedback and reports after analysis should be disseminated by infection control committees, keeping the confidentiality of individuals. The importance of surveillance systems for HCAI control has been accepted globally and some countries have established national surveillance systems with the aim to prevent HAIs. However, the incidence of healthcare-associated infections in many countries is not known due to the lack of a surveillance system. It was demonstrated that hospitals without surveillance systems had increased HCAI rates. A decrease in the incidence of HCAIs was found in the countries that established surveillance systems. A change management strategy should be implemented to inculcate and motivate healthcare workers across all levels to consistently collect reliable data that can be used to measure and reduce the burden of HCAIs. Important considerations when prescribing antibiotic therapy include obtaining an accurate diagnosis of infection; understanding the difference between prophylaxis, empiric and targeted therapy; prescribing antibiotics for the shortest duration; understanding antibiotics characteristics (such as pharmacodynamics and pharmacokinetics); accounting for host characteristics that influence antimicrobial activity; and in turn, recognizing the adverse effects of antibiotic agents on the host. Hospital based programs dedicated to improving antibiotic use, commonly referred to as “Antimicrobial Stewardship Programs” (ASPs), can both optimize the treatment of infections and reduce adverse events associated with antibiotic use. Every hospital worldwide should utilize existing resources to create an effective multi-disciplinary team. The preferred means of improving antibiotic stewardship should involve a comprehensive program that incorporates collaboration between various specialties within an healthcare institution including, infectious disease specialists, hospital pharmacists, clinical pharmacologists, administrators, epidemiologists, IPC specialists, microbiologists, surgeons, anaesthesiologists, intensivists, and underutilized but pivotal stewardship team members, the surgical, anaesthetic and intensive care nurses in our hospitals. ASP policies should be based on both international/national antibiotic guidelines, and tailored to local microbiology and resistance patterns. Facility-specific treatment recommendations, based on guidelines and local formulary options promoted by the APS team, can guide clinicians in antibiotics selection and duration for the most common indications for antibiotic use. Standardizing a shared protocol of antibiotic prophylaxis should represent the first step of any ASP. Education is a fundamental action to combat ABR. On an individual level, healthcare workers should have the necessary knowledge, skills, and abilities to implement effective infection prevention and control practices and antibiotics prescribing practices. Increasing the knowledge may influence their perceptions and motivate them to change behavior. Education and training represent an important component for accurate implementation of recommendations. It is also crucial to incorporate fundamental ASP and infection prevention and control principles in under- and post graduate training at medical faculties to equip young doctors and other healthcare professionals with the required confidence, skills and expertise in the field of antibiotic management. Hospitals are responsible for educating clinical staff about infection prevention and control and Antimicrobial stewardship programs. Active education techniques, such as academic detailing, consensus building sessions and educational workshops, should be implemented in each hospital worldwide according to its own resources. However, increasing knowledge alone may not be sufficient for effective infection control and may be insufficient to effect sustained change especially considering the multi-factorial nature of the problem of ABR. Peer-to-peer role modeling, and champions on an interpersonal level have been shown to positively influence implementation of infection control practices. Many practitioners use educational materials or didactic continuing medical education sessions to keep up-to-date. However, these strategies might not be very effective in changing practice, unless education is interactive and continuous, and includes discussion of evidence, local consensus, feedback on performance (by peers), making personal and group learning plans, etc. Identifying a local opinion leader to serve as a champion may be important because the “champion” may integrate best clinical practices and drive the colleagues in changing behaviors, working on a day to day basis, and promoting a culture in which infection prevention and control and antimicrobial stewardship is of high importance.